Before performing this task, review the following cautions. Caution - A server module can weigh as much as 17 pounds (8.0 kg). During removal, hold the server module firmly with both hands. Caution - Do not stack server modules higher than five units tall. Caution - Insert a filler panel into the empty server module slot within 60 seconds after removing a server module to ensure proper modular system chassis cooling. 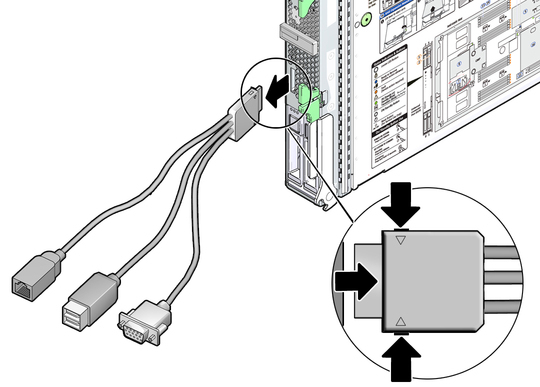 If a cable is connected to the front of the server module, disconnect it. Press the buttons on either side of the UCP to release the connector. Open both ejector arms (panel 2). Squeeze both latches on each of the two ejector arms. 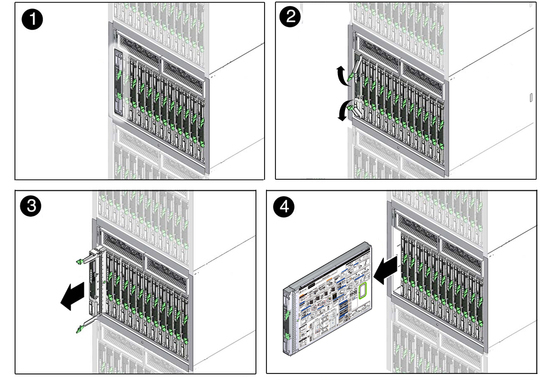 Pull the server module halfway out (panel 3). Remove the server module from the modular system. Lift the server module with two hands. Place the server module on an antistatic mat or surface. Insert a filler panel into the empty chassis slot. Note - When the modular system is operating, you must fill every slot with a filler panel or a server module within 60 seconds.